This addon allows you to do shopping cart checkout using Alipay payment gateway. Step 1: Enable Alipay from the settings section of the addon. 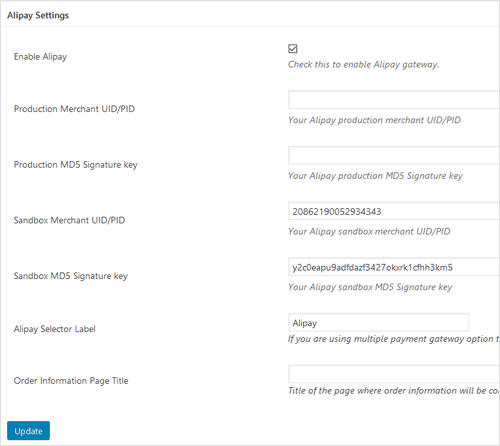 Step 2: Enter your Alipay merchant account credentials. You can retrieve them by logging into your Alipay account. Step 3: Enter your preferred checkout text for Alipay gateway (example: Alipay). This text will be used in the eStore shopping cart gateway selection drop down menu if you are using multiple payment gateway options.